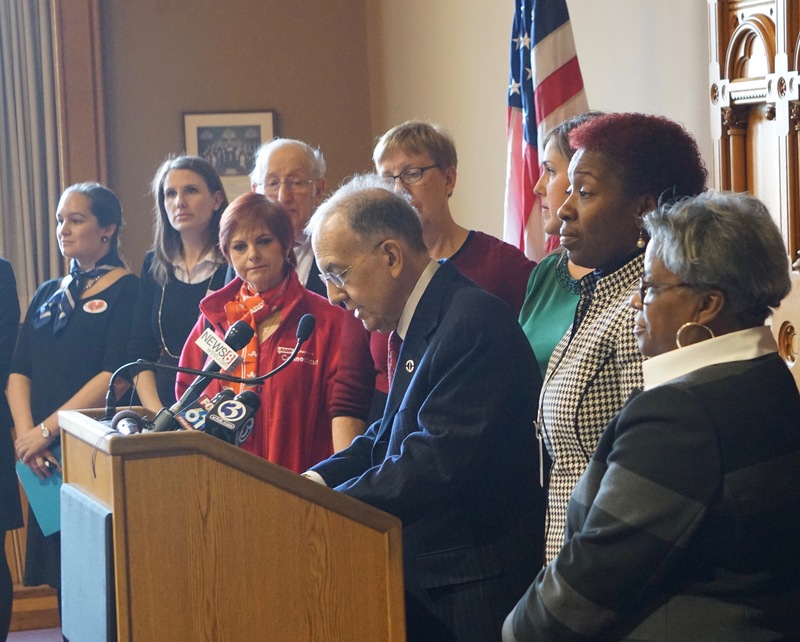 Senate President Martin M. Looney and other supporters of paid family leave and a $15 minimum wage. The Democratic leader of the evenly divided state Senate led the kickoff Thursday of an uphill campaign to raise the $10.10 minimum wage to $15 on Jan. 1, 2022, and also make Connecticut the fifth state in the U.S. to enact a worker-funded insurance program of paid medical leave. Senate President Pro Tem Martin M. Looney, D-New Haven, said the two bills were urgent matters of economic justice, but he conceded lacking votes for passage in the face of significant business opposition and a skeptical Gov. Dannel P. Malloy. Once a leader in the push for a higher minimum wage and family-leave benefits, Connecticut’s legislative Democrats have grown more cautious as they have lost seats while struggling to address a fiscal crisis and a reputation for hostility to business growth. A bill similar to the paid family leave bill sponsored by Looney never came to a vote last year, and its prospects did not improve in November with the Democrats’ loss of three seats in the Senate and eight in the House. Only the ability of Lt. Gov. Nancy Wyman to break tie votes gives the Democrats an edge in the Senate. The GOP is four votes short of a majority in the House. With a coalition of groups allied with unions and low-wage workers, Looney and legislative allies made the case for the two progressive priorities at a press conference Thursday that preceded a public hearing that drew opposition from trade groups, restaurants and other small businesses. House Speaker Joe Aresimowicz, D-Berlin, did not attend the press conference, but he issued a statement of support. A spokeswoman for Malloy highlighted the governor’s support for previously adopted labor measures and endorsed the concept of a minimum-wage increase, but not the specifics of Looney’s bill. The Malloy administration supports the concept of paid family leave, but was hoping the administration of President Trump would work on a federal version, she said. In 1989, Connecticut became the first state to pass a family and medical leave law that guaranteed workers at larger companies they could return to their jobs after unpaid leave for the birth or adoption of a child or to care for a sick family member. In 2011, Malloy delivered on a campaign promise by coaxing the General Assembly to pass a limited mandate on employers to provide paid sick days. Manufacturers, some non-profits and employers with fewer than 50 employees are exempt. In 2014, Connecticut became the first state to pass legislation meeting President Obama’s goal of a $10.10 minimum wage with a bill that raised the $8.70 hourly wage to $9.15 in 2015, $960 in 2016 and $10.10. Looney’s new minimum wage bill would call for annual raises of about $1 in each of the next five years, reaching $15 in 2022. Future raises would be pegged to the cost of living. New York City, Washington, D.C., and California have $15 minimum wages that take effect between Dec. 31, 2018, and Jan. 1, 2022. New York City’s minimum wage for employers of 11 or more workers goes to $15 at the end of next year. It hits $15 in downstate counties outside the city at the end of 2021. According to the Connecticut Low Wage Employer Advisory Board, at least 20 percent of the state’s workforce earns less than $15 an hour. A study by the Federal Reserve Bank of Boston estimates that in Connecticut one third of female workers, 43 percent of African Americans and 52 percent of Latinos are paid less than $15. The majority, according to the advisory board, are the primary earners in their families. Sen. Mae Flexer, left, with Yvonne Rodriguez, who says she makes $10.10 at two jobs. 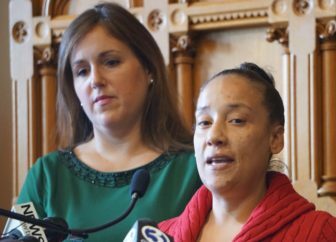 Yvonne Rodriguez of Hartford said she needs public assistance to get by despite working two jobs, each paying her $10.10 an hour. She said she performs home care as a certified nursing assistant and also works 20 hours a week at Dunkin Donuts. California, New Jersey and Rhode Island now have paid family leave. New York passed a paid leave law that takes effect Jan. 1, 2017. Since the leave program is funded by workers, Looney and other legislative supporters say the measure is pro-business. Some small businesses have indicated support, but they are a minority. Trade groups and individual businesses submitted testimony opposed to the minimum wage and leave bills. James Bitzonis, the owner of five Buffalo Wild Wings franchises, said a $1 increase in the hourly minimum wage increase would cost him about $185,000 annually. Eric Gjede of the Connecticut Business and Industry Association said the legislature should not mandate a higher starting wage at a time when the economy still is weak. Connecticut was one of 19 states that began 2017 with a higher minimum wage. The federal minimum wage is $7.25, which must be paid in states without their own minimum. The chart shows current minimums for Washington, D.C., and the 50 states, plus scheduled increases. Some states index future increase to the cost of living. New York $9.70 $15 for large employers in NYC on Dec. 31, 2018, with later effective dates by region.